Yeah. We were wrong. We needed spikes. I have ridden my bike (and pushed it and fallen off it) in all sorts of horrible conditions over the years, from minus double-digit cold and mud-caked pine plantations to axle-deep snow and blanket bogs, but I have never encountered riding surfaces as slippery as those we tried to race on at last weekend’s ice-bound, frost-blighted, freezer-burned Strathpuffer 24. 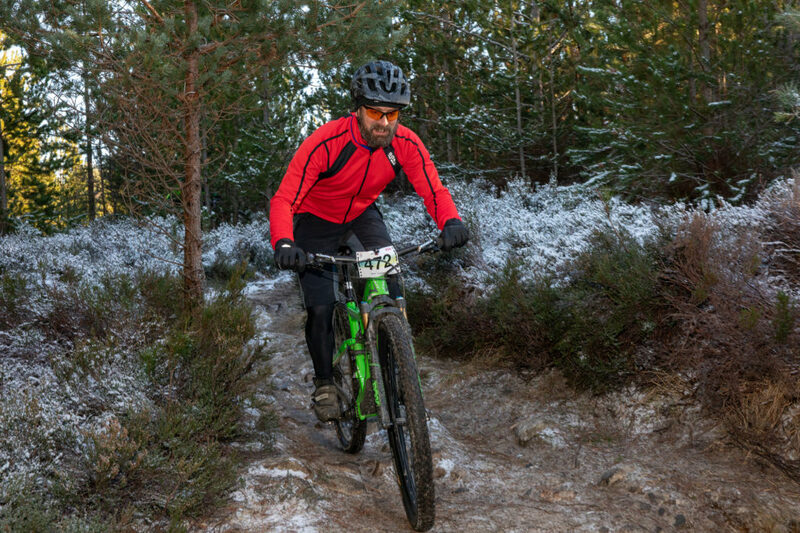 Unsurprisingly for a day-long race held in the far north of Scotland in the middle of January, the Strathpuffer already has a fearsome reputation, and this year’s event will have done that reputation no harm at all. 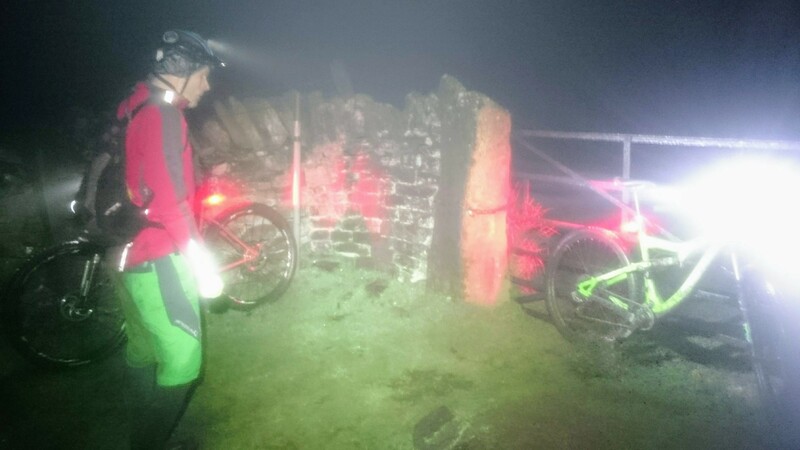 It inevitably sells out fast, attracting hundreds of hardy riders keen to measure themselves against a testing cross-country course in sub-arctic conditions with brief stretches of thin daylight sandwiching seventeen hours of darkness. The bravest attempt a solo ride, bashing out laps alone for the full length of the event, but obviously that would be way beyond my limited abilities at the best of times; I was instead taking part as one quarter of a quad, meaning that at most I’d need to do about six hours riding spread across the whole event. 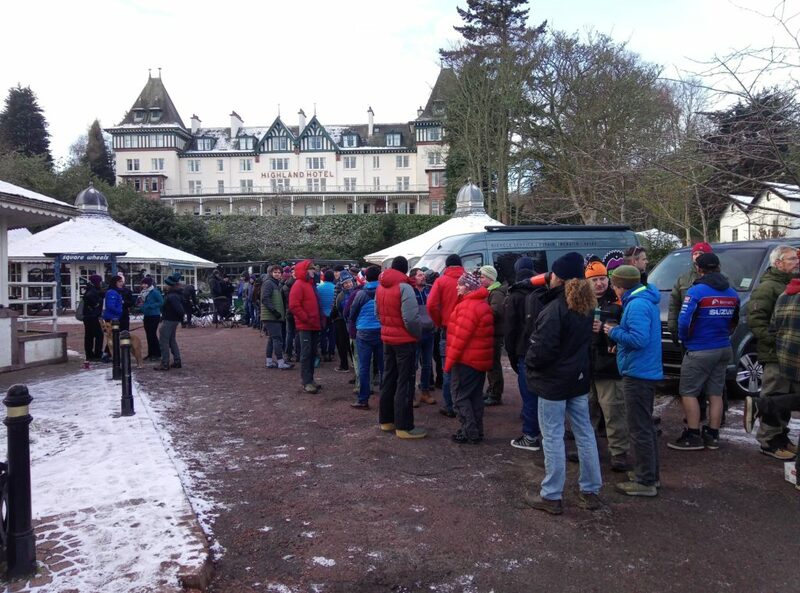 The logistics of running the event in Contin Forest, which has limited opportunities for parking race support vehicles, mean that competitors really need to establish a base on site on the day before the race. For us that meant doing a nine-hour drive to Inverness the day before that, Thursday, to be on time to pick up the single parking pass allotted to our team and to get onto the course to bag a decent spot. 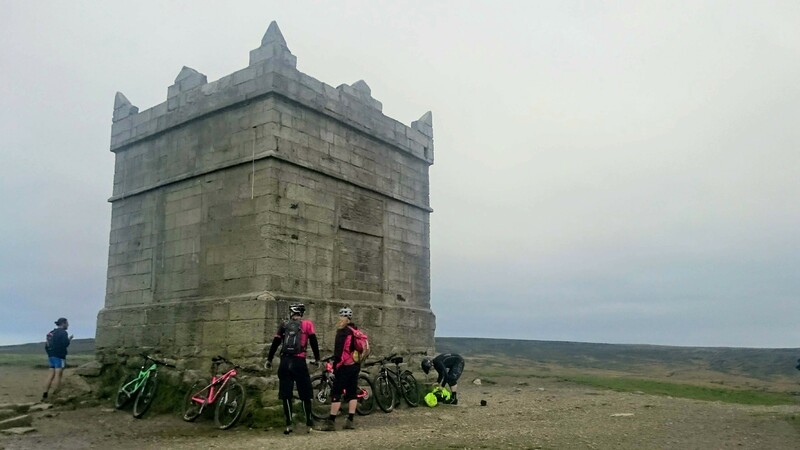 We were carrying equipment for a number of other groups of riders, including two massive EZ-Up shelters for Team JMC, and we pulled out all the stops to snag a pitch about a third of the way up the main climb above the start/finish area. We spent the rest of Friday setting up as much kit as possible and guiding in various friends and acquaintances as they arrived, before retiring to a nearby B&B for a few beers and a good night’s sleep. The next morning dawned some time after we’d got up and had breakfast, this being northern Scotland, but once the sun did finally show it illuminated a beautifully clear day with barely a cloud in the sky, no wind to speak of and snow dusting the hills. Everywhere was frosty and breath condensed into large clouds as riders rode slowly up and down the fireroads preparing for the 10am start. 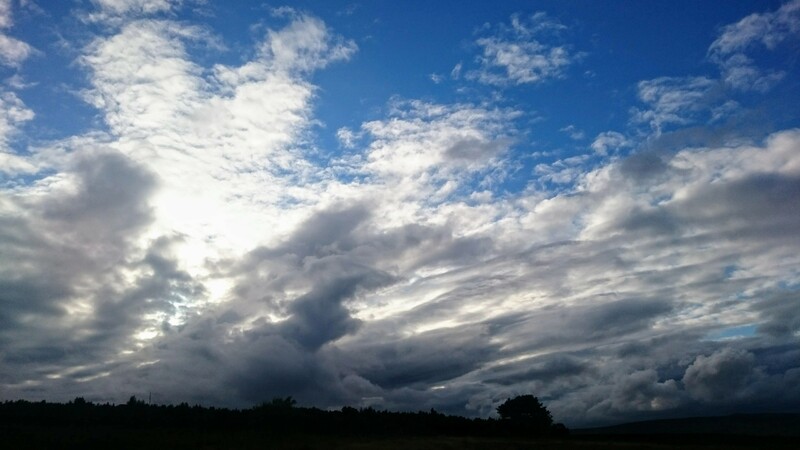 The implications of these cold temperatures, coming as they did after a much milder and wetter week of rain, would shortly become clear to all, but for now most of us were feeling optimistic and happy that we were going to be spared the misery of a wet, muddy slog. The race itself begins with a Le Mans style run with the pack of riders dashing free-for-all up the first fire road to retrieve their bikes from the melee of assistants and spectators lining the start straight. 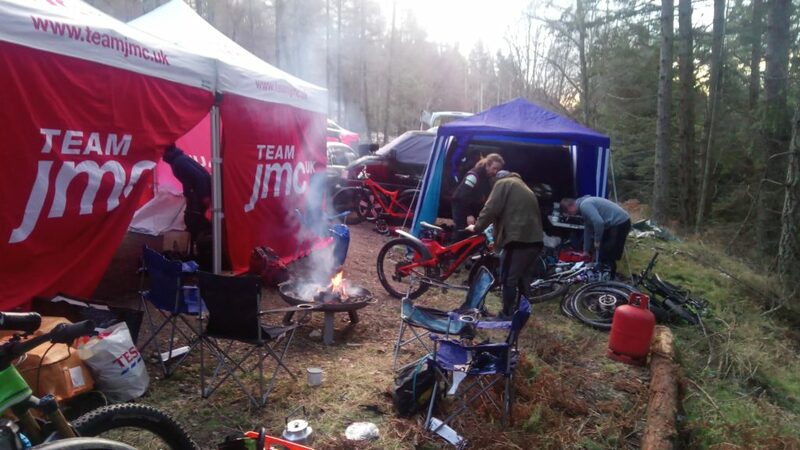 I had been roped into holding bikes for both my teammate Daz and also for proper fast solo rider Rich Rothwell who was sharing our base camp with us. Rich somehow managed to run clean past when another racer fluffed up a CX remount and crashed right in front of me, but we managed to untangle everything fairly quickly and the lads were on their way. Whilst the main fire road climb was dry and clear, lulling us into a false sense of security, the previously discussed clear frosty weather, following immediately on from days of rain that had soaked deep into every surface, had inevitably resulted in the formation of black ice pretty much everywhere else. When the first rider came through after a lap, they responded to a yelled query about the conditions under-wheel with two words: “ICY DEATH!” This was further attested a few minutes later when Daz returned to the pits with torn leggings and a bloodied knee, having crashed hard twice. Riders were hitting the deck with alarming frequency, and we later heard that in the first hour or so seven people reported to First Aid with broken collarbones. The entire course was as cold, slippery and unpleasant as a Tory cabinet minister. Every rock, boulder and pebble was coated with a layer of invisible, teflon-slick frozen water, and even surfaces that looked grippy, like hard-packed fire road, were unpredictably lethal. One section of the course, just above the final descent, snaked through old growth woodland, and had somehow managed to remain fairly ice-free, with the result that the singletrack was merely laced with the usual damp, slimy tree roots. Normally I’d approach this sort of thing with great trepidation, but in comparison to the rest of the route this stretch was grippy and solid, and on subsequent laps the wet wood and mud hereabouts provided a welcome relief from icy rocks. Four-time race veteran Rich Rothwell pronounced conditions the worst he’d ever seen – he abandoned after five laps due to feeling unwell, but the state of the course can’t have helped much. 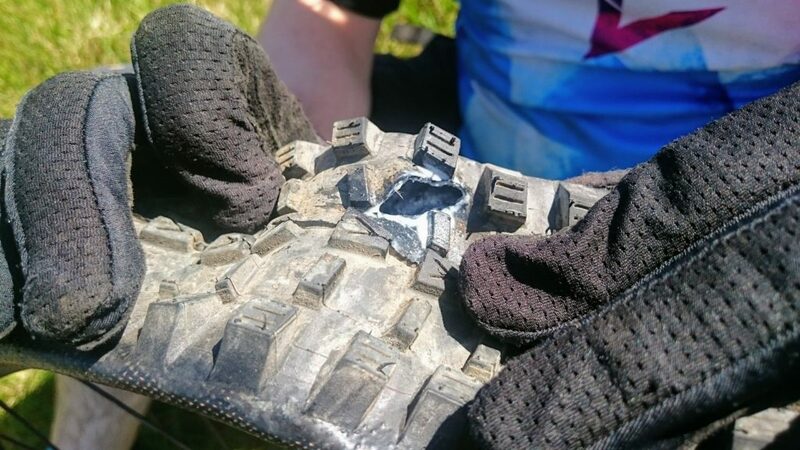 Whilst I was out on my first lap, experiencing the friction-free excitement of verglassed bedrock on summery XC rubber, my teammates excavated a pair of Schwalbe Ice Spiker tyres from the mountain of spares, and fitted them to two front wheels. By adjusting a few brake calipers we were able to set up each of our four bikes to accept one or other of these wheels, and we spent the rest of the race swapping these over to give us a fighting chance at not crashing every ten yards or so. I have never used ice spike tyres before, preferring to just stay at home when the weather is really properly daft, but I have to say I’m thoroughly impressed. They aren’t infallible, but they do allow you to ride your bike like it has normal mountain-bike tyres on in the sort of circumstances where normal mountain-bike tyres will dump you on the floor without warning. On my second lap I rode warily through a section where my fast-rolling front had done just this a few hours earlier, but the tungsten carbide spikes held, making a satisfying velcroey sound, and whilst my back wheel did playfully try to dash off into the distance from time to time, by riding the front hard down everything and assuming that the back would eventually follow along some approximation of the same line I was able to stay person-side up almost all the time. As the race progressed into the darker hours we switched from a single-lap strategy to putting in double laps and my turn came up at around 9PM. I headed out onto the hill under clear skies and in between dodging crevasses and avoiding yetis I managed to sneak a few glances at the starry sky and near-full moon illuminating the snowy mass of Ben Wyvis to the north. The scenery hereabout is lovely, the undulating terrain softer and less imposing than the bigger mountain ranges to the west and south, but no less appealing, and I was glad to be out in the wintery hills riding my bike, or trying to, even if the trail itself was in rather less than ideal condition. The course quietened down noticeably as the night progressed, and many teams and riders clearly started to take long breaks as the darkness took hold. 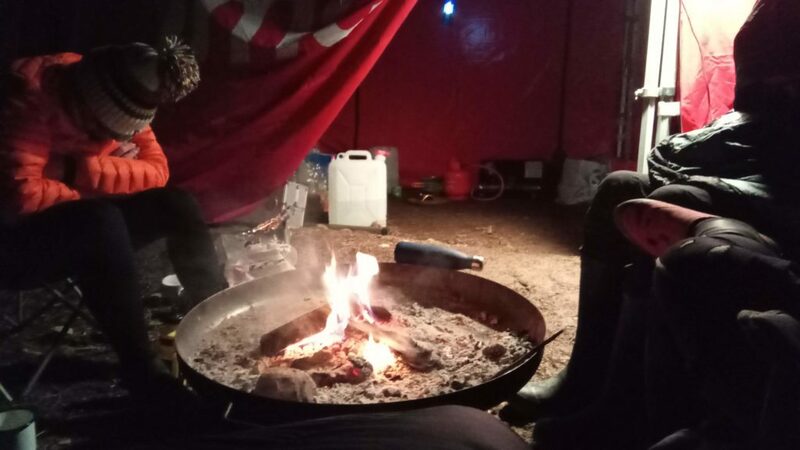 After my two laps were up I refuelled with some noodles and crashed out on the back seat of the van, cocooned in sleeping bag and quilt, where I managed to get a surprisingly decent few hours rest in between occasional disturbances as teammates went out or returned from their own laps. Eventually I prised myself out of my nest with a very sore back and headed out for my next turn at around 5AM. The dedicated team of marshals remained spread over the hill all night, paying particular attention to the trickiest bits of the course, and I was greatly reassured by the occasional sight of friendly hi-viz clad figures picking up the odd crashed competitor below some of the most slippy sections. I had largely managed to avoid any further incidents until this last lap, when a clumsy entanglement with another rider on an iced-up hump of bedrock ended with me clattering my right knee quite hard. 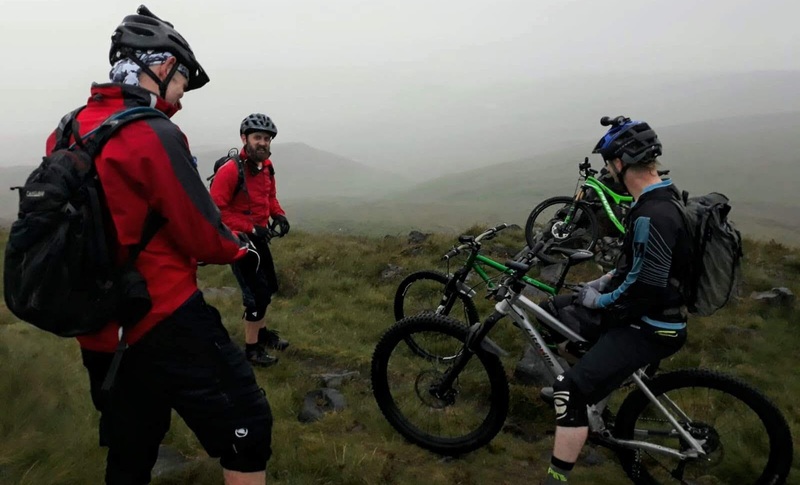 I initially thought I had got away with it but within five minutes the pain was noticeable on pedalling, and by the time I reached our camp I had slowed to a crawl on the hills and decided that pulling out was probably the best plan. I still had a nine hour drive home to deal with and I rather needed my right leg to be able to operate the van properly, so I announced my retirement to Rik and started to pack up. Rik did a further lap as the sun rose, but on his return Kai and Daz had both elected to stop riding also, so at around 8.30 we called it a day and began to break camp. We headed down to the finish line for the final hour or so of the race to watch friends roll in, grab some breakfast and generally soak up the atmosphere of the end of the event. Our results were respectable enough, we ended up in 34th place (out of 90 teams) in the Male Quads category, after 22 laps over 21h49. Had I been able to put in another lap I could have possibly dragged us up to around 25th position, but I don’t think this would have been a great idea as my knee is still a bit sore several days later and pushing through it could have made things significantly worse. We were pleased to see our fellow Monday Night Pub Rider (and Team JMCer) Jason Miles take the win in the mixed pairs category with riding partner Sofia Christiansen, an impressive feat as they had to put in a very hard race to do it and apparently Jason crashed umpteen times on the last lap as a bout of sleety rain made the course yet more treacherous. With the race over we headed back to the van and finished loading everything in as quickly as possible. We were off site by around 11.30AM, and on the road properly before lunch time. I shared the drive back with Rik, dropped off various borrowed items on the way, and crashed into bed too tired to even manage a celebratory recovery beer. Strathpuffer is a very tough event, and whilst I was suffering on the course I swore to myself that I’d never do anything like this again, but inevitably, now I look back on it, I start to question whether I’d be able to put in a more convincing performance, perhaps by doing some training, setting my bike up with ice tyres, working on core strength, not getting injured, the list goes on. 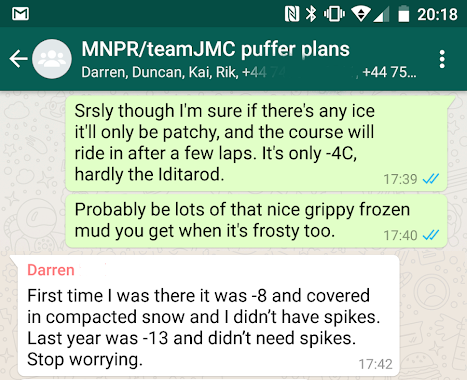 I was gratified to read in an event wrap-up email from the organisers that “Seriously icy conditions out on the track made it, probably, the most demanding Puffer ever”, which is good to know. Even in light of the ice and cold, I definitely think this attempt went much better than my last stab at a 24, from which it took me weeks to recover before I could even look at a bike again. I don’t think I’ll be back to race in Contin next January, but I might still have a crack at some other endurance event before too long. 2018 was a good year! (Obviously I’m talking about riding bicycles here, not other less important stuff like, well, pretty much everything else.) I got off to a fairly low key start with a couple of fun snow rides, but things picked up nicely in spring and early summer with sunny adventures and races on amazing dusty, dry trails. 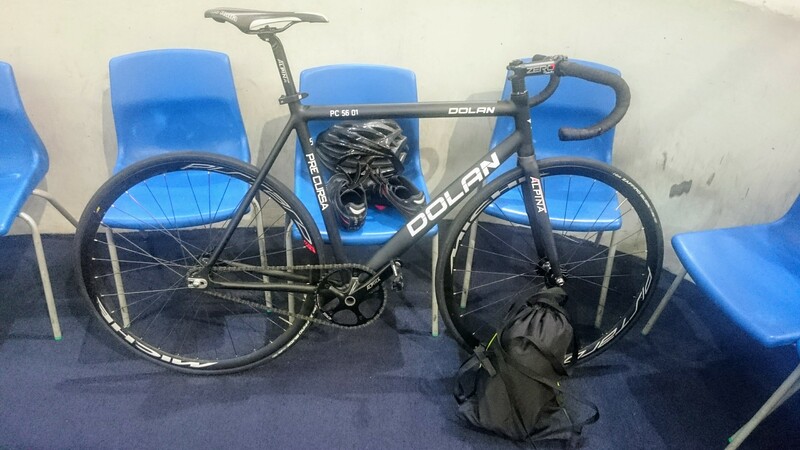 The school holidays were the usual blighted hellscape, but I was able to get back into things in September for the highlight of the year for me, my first 3 Peaks CX, and carried the trying-new-things momentum on through October and November with some visits to the velodrome. December has been a bit of a washout due to family commitments but I still feel like I got a good solid set of rides in overall. I have a few exciting plans for 2019, so all being well I should be able to keep on rolling. 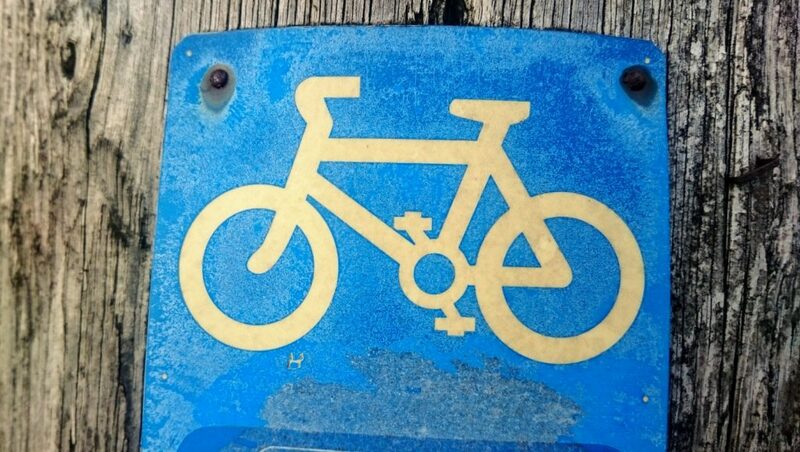 Here’s to the next twelve months worth of two-wheeled fun: happy new year! Contrary to the evidence of the above picture, November is in fact rubbish. It’s an awful month: cold and dark and getting worse by the day, but without any of the compensations of the holiday period (not being in work, being allowed to get drunk every day etc). Last year I made a concerted attempt to head off the usual seasonal slump by getting up early and riding my bike as the sun dragged itself blearily into the sky, and I managed a few excursions like this before a root-canal abscess flared up and knocked me back onto the sofa for a couple of weeks. This year I decided not to jinx things by posting smugly about how much I’ve been doing until nearer the end of the month, hence the lack of updates. I have got quite a bit done though. I’ve been going round and round in circles on the National Cycling Centre velodrome, which is interesting, and I’m hoping to progress through a few accreditation stages this winter. It’s a novel experience and the early coaching is as much about learning the various rules and conventions of track riding as it is getting physically used to the bike and boards. Great fun. 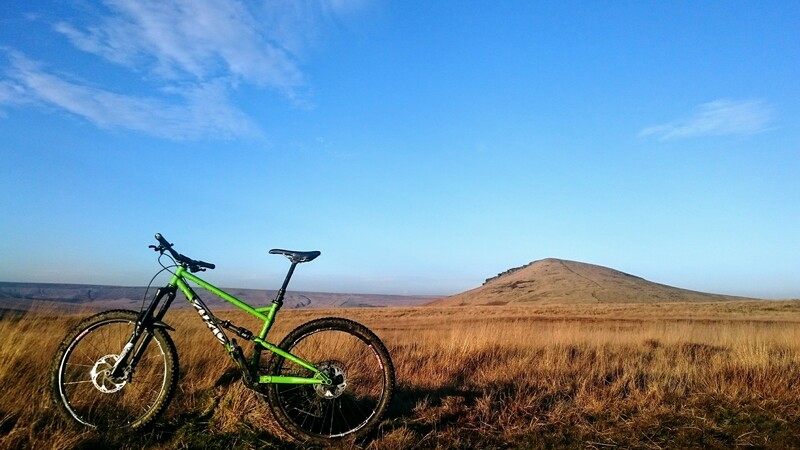 I took a month off riding outside following the Three Peaks CX, but dropped myself right back in at the deep end at the start of November with a forty mile MTB grind around Lancashire taking in visits to the three towers of Rivington, Darwen and Ramsbottom before a huge drag up Winter Hill. 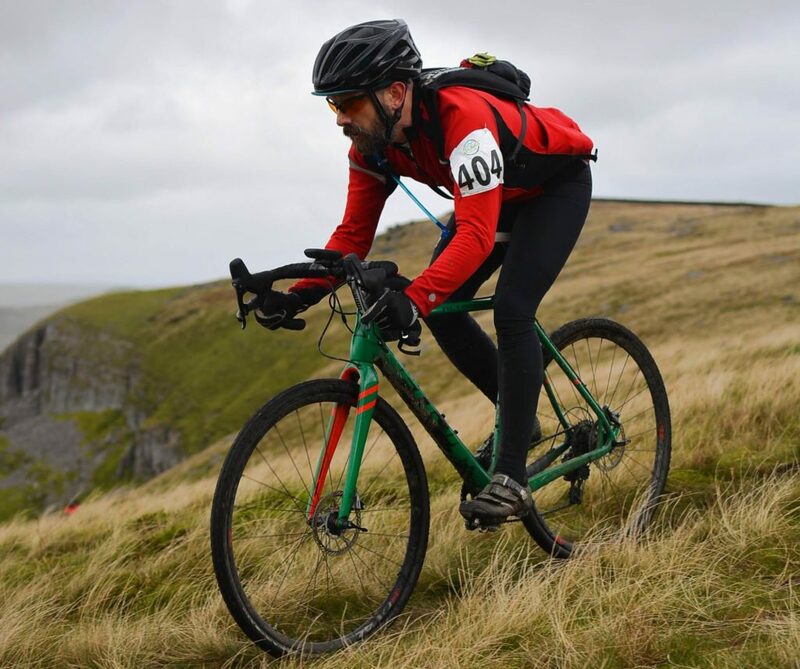 This windswept jaunt was the first serious outing for what is supposed to be training for the Strathpuffer, the 24-hour endurance race that takes place in the north of Scotland in January. 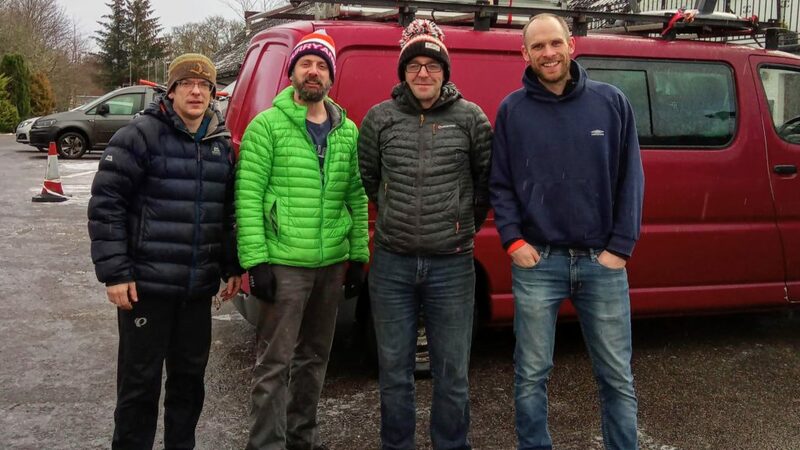 I’m part of a four-man team, thankfully, so I’ll only have to weather six hours or so of riding in freezing mud and darkness, but even so I’m going to need to continue loading the miles into my legs to keep myself going in the middle of the night. This loosely-organised training plan was also the reason for last Saturday night’s 60km slog over the Pennines with my ‘Puffer team-mate Kai. We set off from Hadfield at just before 9PM, and followed a good solid off-road loop all the way round the top corner of the Dark Peak via the moors above Saddleworth, Marsden, Holmfirth and the Woodhead Pass, through rain, fog and freezing sleet, all in the name of acclimatising ourselves to the sort of conditions we’ll be dealing with in January. We got pretty cold and wet but Kai kept us rolling along at a good fierce pace and we put the whole ride away inside five hours, which was a fair bit quicker than I expected. I enjoyed the outing and we didn’t encounter any serious problems, but I was fairly well chilled by the time I got back to the van. Hopefully the traditional strategy of taking every last bit of bike kit I own with me will avoid any hypothermia episodes in January. 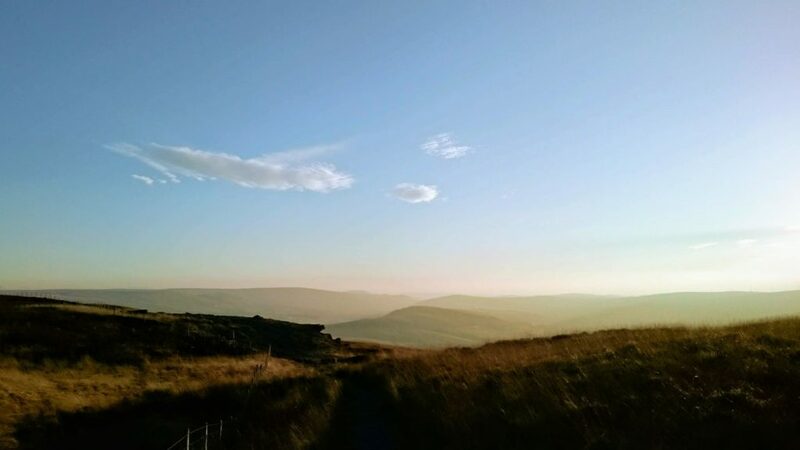 It’s not all been grim, wet, muddy riding this month, though and I managed to get out on a lovely crisp autumnal day mid-month, following a short but enjoyable loop above Marsden where I saw a Short-eared Owl, a beautiful sunset, and almost no humans at all. The moors have died back to their winter colouring, all brown and yellow, very pretty in the low sun, and frost has killed off all the midges so you can stand and admire the views for as long as you like. The breeze had even dried off the rocks enough that there was plenty of grip in-between the muddy puddles, although inevitably I encountered a herd of grumpy old ramblers on the best bit of the final descent of the day, because where else would they be? And last but not least, in terms of suffering at any rate, I have also been out running. Don’t tell anyone, ok? 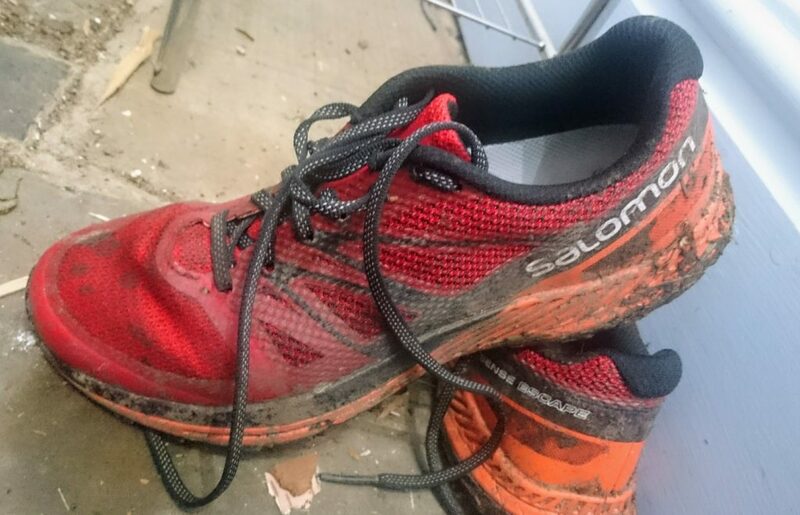 I always swore I’d never take up running, on account of it being horrible: it’s slower and much less fun than riding a bike, it’s much more painful, and it’s liable to knacker your knees. But in the name of cross-training this month I’ve run 70-odd kilometres, mostly on trails, and I have to say… it’s still horrible. Absolutely awful. It does have one virtue though (apart from getting you fit fast): when the weather is absolutely minging, it’s not actually any more horrible. 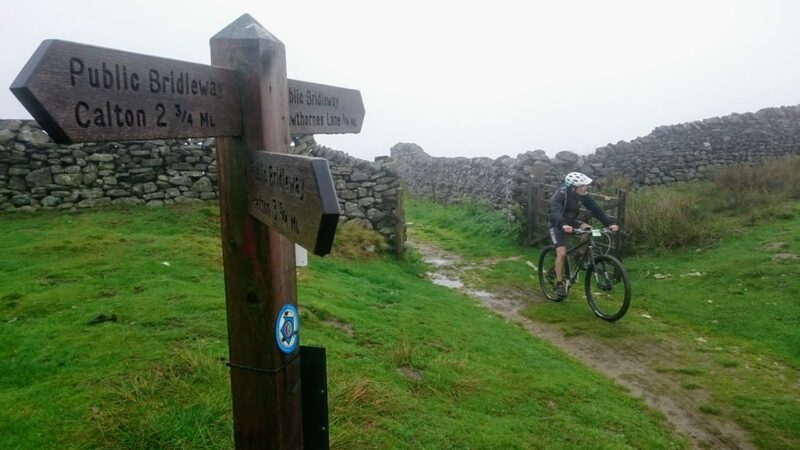 Wind and rain and general normal November conditions can really spoil a bike ride, but with running it’s not really much different whether it’s chucking it down or not. When you’re squelching across some godforsaken boggy field, gritting your teeth up some disgustingly steep farm track, or galumphing down a perfectly good descent in a pair of pumps rather than zooming down it on a bike, the weather is pretty much irrelevant. I still hate running, but at least it gets me out of the house. That pretty much sums up my November for this year, and I feel like I’ve landed a few solid hits on my least favourite month this time round. I’m a lot happier than usual and a big part of that has to be down to not just wallowing on the sofa and hiding from the world. Hopefully I’ve also started to set myself up reasonably well for surviving what might be a rather brutal start to next year’s bike antics at Strathpeffer, although of course it remains to be seen if I can carry the momentum over into December and through the holidays and keep the training going. 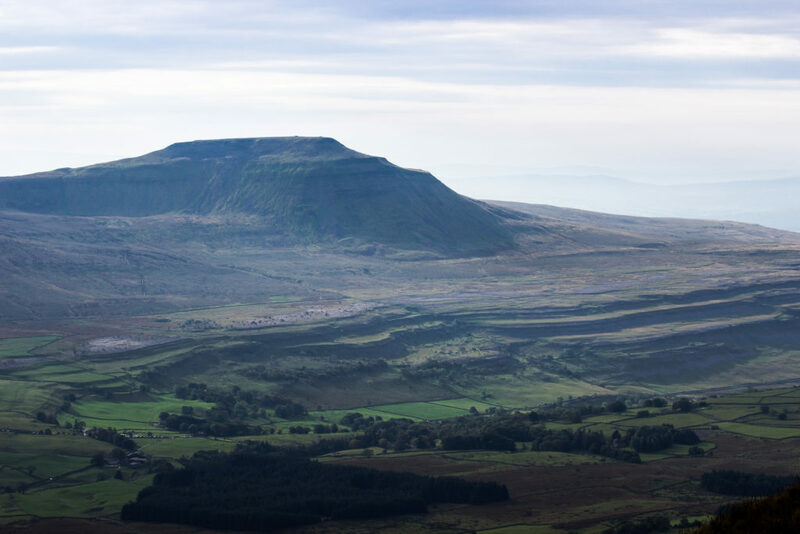 After passing through the crowds at Blea Moor the road to the foot of Penyghent gave me chance to catch Rik again, but inevitably he reversed the situation once more on the final climb, and my pace dropped and dropped the higher I got. By now I had a headache, my back was ruined, and my legs were on the verge of cramping at nearly every step. I was reduced to stumbling along at a couple of miles per hour, wheeling my bike up the final slopes, utterly wasted. As I climbed back on and started the descent from the last summit checkpoint I felt too tired to even dismount again, and resolved to just hold on and grit my teeth for the whole descent, or crash, whichever happened first. I let go of the brakes and allowed the bike to run once more, freewheeling and clattering down any available line. 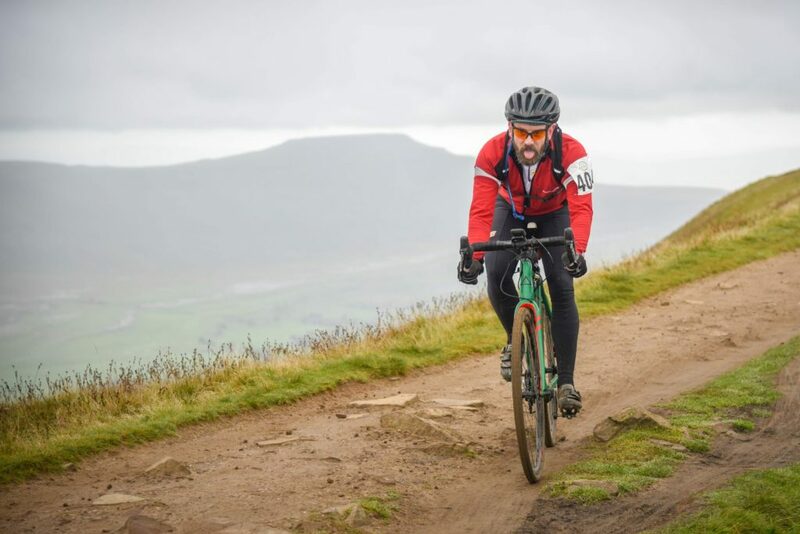 I trusted that my finely-honed mountain-biker instincts for picking soft spots to stack onto would save me from total disaster, and as my legs slowly recovered a little I found I was even passing a few riders. The lower sections of Penyghent Lane are covered in loose babyhead rocks, a surface that seemed to cause problems for many other riders, but which I normally find enjoyable and entertaining to ride on, and with the final few miles in sight I felt my spirits lift and I picked off several more places. The last road stretches to the finish are almost flat, and unbelievably I found myself sat on the front of a miniature peloton as I span along, happy enough until we reached the fearsome Cote De Helwith Bridge. This is fifty yards of approximately 3% incline which normally wouldn’t even register as a gentle slope, but at the end of this race it slowed me from about 20mph back down to little more than walking pace. My passengers shot past, leaving me to roll back to the finish line for a completion time of 4h43m51s and 389th place, supremely pleased just to finish, and over the moon to do it well under my target of five hours. Rik managed to beat me to the final checkpoint by two seconds, and Andy made it round in 5h39m28s. For those who care about this stuff I was on a Fuji Altimira 1.3 2017 with mostly stock kit but with a KS Zeta 50mm dropper post (highly recommended) and Vittoria Terreno Mix tyres run tubeless at 50psi front, 60psi rear, which were great, but do seem to wear out fast. I ran 36 x 11-32 gearing, and could definitely have done with a lower ratio or two towards the end of the race. 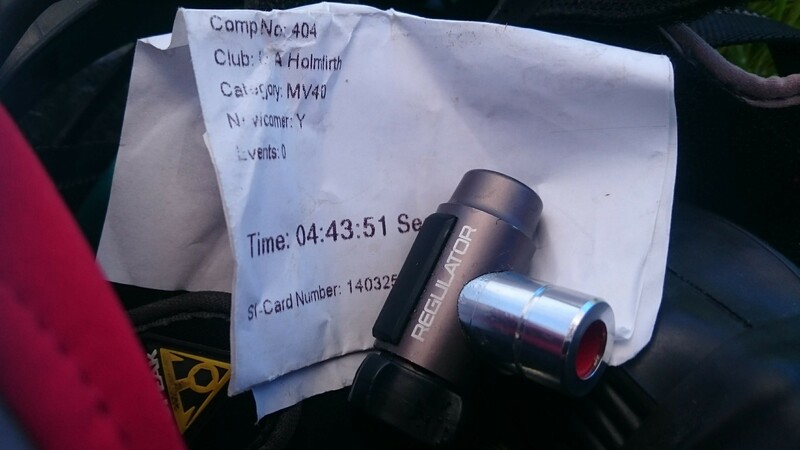 I had no punctures and no other major mechanical issues, although there were a few creaks and groans coming from the bike towards the end, so it’s going to have a bit of a service before I race it again. I drank about 1.5L of water carried in a Camelbak and ate four gels and half a bag of jelly babies. 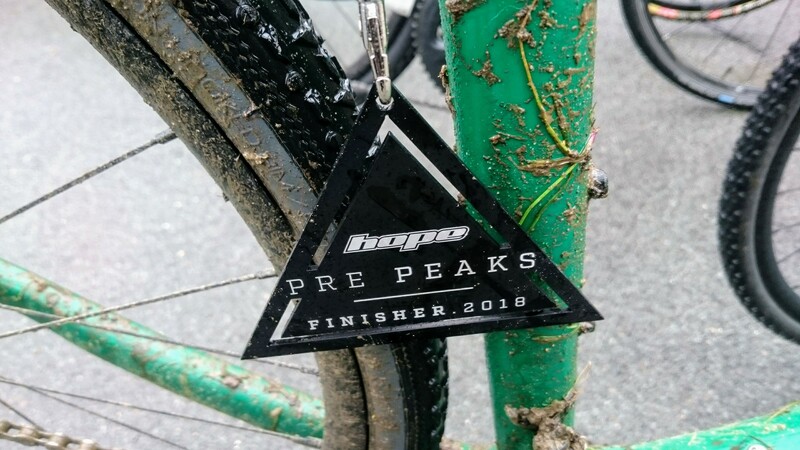 I’m still aching all over several days after the event, but I thoroughly enjoyed myself, and the horrible bits (the hills) were mostly horrible in a satisfying, type-2 fun sort of way. Even the slog up Penyghent was worth it in hindsight; getting yourself to the top of something when you feel like it’s almost impossible is gratifying in a way that an easy ride will never be, and just letting everything hang out on the descent afterwards was highly rewarding. I will probably see if I can get a spot on the race next year, and if not I may well marshal to ensure that I can ride the year after. I’m definitely interested to see if I can better my time, getting closer to 4h30, perhaps by doing some proper training or something crazy like that. The atmosphere and support from the volunteers and spectators all the way round the course was brilliant, everyone seemed happy to be stood out on windswept hilltops or in boggy fields to encourage and safely shepherd herds of lunatics on unsuitable bicycles around the place. Most of the walkers encountered were happy to share the paths with us (with one exception in a miserable old baggage on Penyghent, who hopefully didn’t manage to actually knock anyone off their bike with her inconsiderate antics – mardy-arse ramblers would perhaps be well advised to choose from the thousands of other paths in the area that aren’t used by the race for the few hours of the one day each year when it takes place, just a suggestion). All my fellow racers were kind and considerate to one another in what are pretty testing circumstances, and I saw no poor sportsmanship or shenanigans at any point. 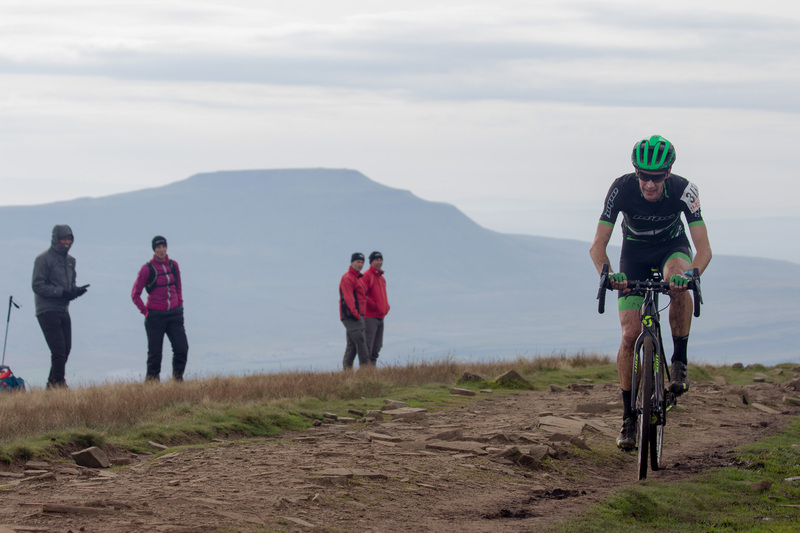 As an event, the 3 Peaks CX is unique and brilliant, and should really be on any serious bicycle rider’s to-do list. It is sufficiently difficult that even the very best will find it challenging, and pure fitness alone will not carry you through. I lost count of the number of whippet-thin roadies who looked out of their depth on the downhills, fell-runners without pedalling miles in their legs will find the linking road sections a serious chore, and mountain biker adrenaline junkies will be in over their heads if their fitness and abilities on a skinny-tired, rigid bike aren’t up to scratch. You need to be both a good all-rounder and in pretty good trim to even finish this race, but it’s well worth the challenge. 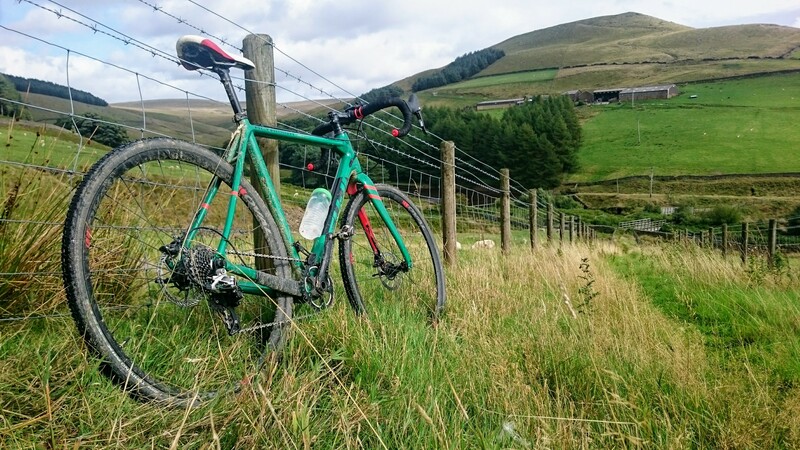 In typical style I finally started panicking about the Three Peaks CX race less than a month before the event, and have been hauling myself over the local hills in an attempt to accustom my legs to the concept of pedalling properly again after a summer holidays’ worth of neglect. 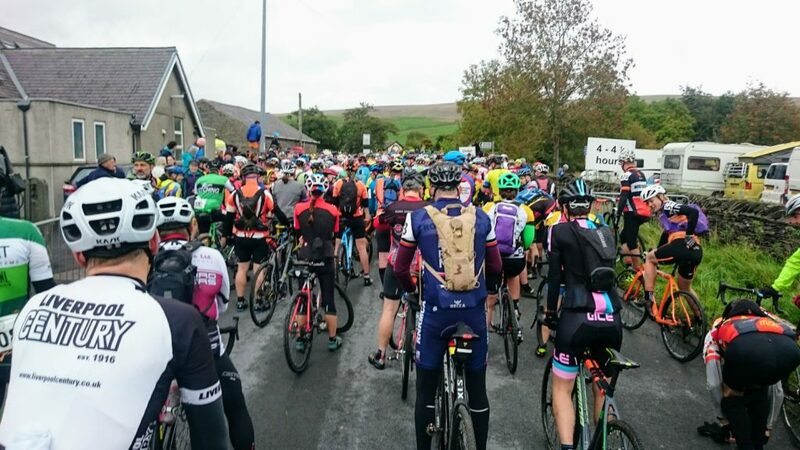 The weather hasn’t been ideal but then given the considerable chances of the race itself taking place in grim conditions that is no bad thing, and even grinding up and over Holme Moss into the teeth of the first winter storm yesterday I didn’t feel too bad. 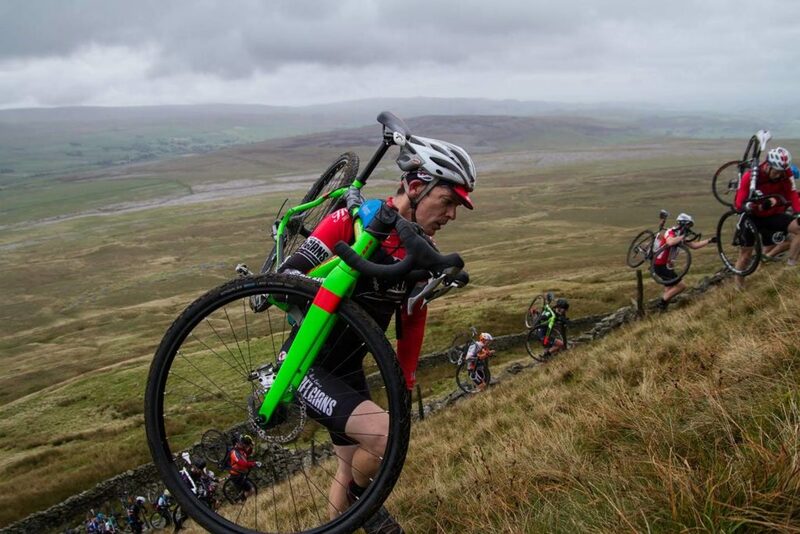 I’m almost looking forward to slogging the cross bike round Ingleborough, Whernside and Penyghent now. Almost. The weather is very much back to normal now, and last Sunday’s Hope Pre Peaks ride gave me and several hundred other lunatics chance to remind ourselves what riding in the Great British summer is really supposed to be like. 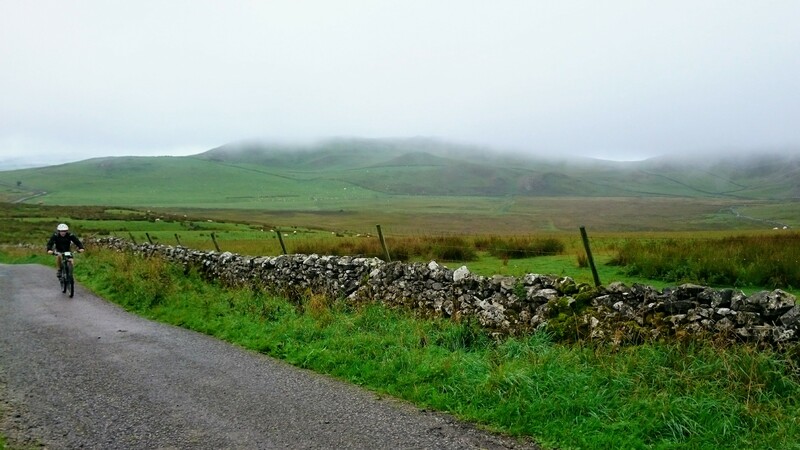 We had five hours of that good, old-fashioned drizzly rain that thoroughly soaks everything without making a fuss about it, along with a classic logic-defying circular headwind, and plenty of low cloud to obscure the scenery. 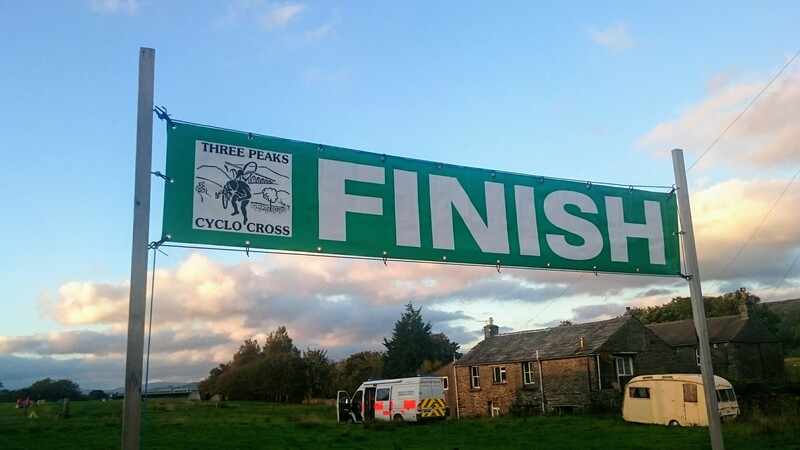 The Pre Peaks, as the name suggests, is supposed to be a warm-up event for the Three Peaks Cyclocross race, which I am apparently taking part in at the end of next month. 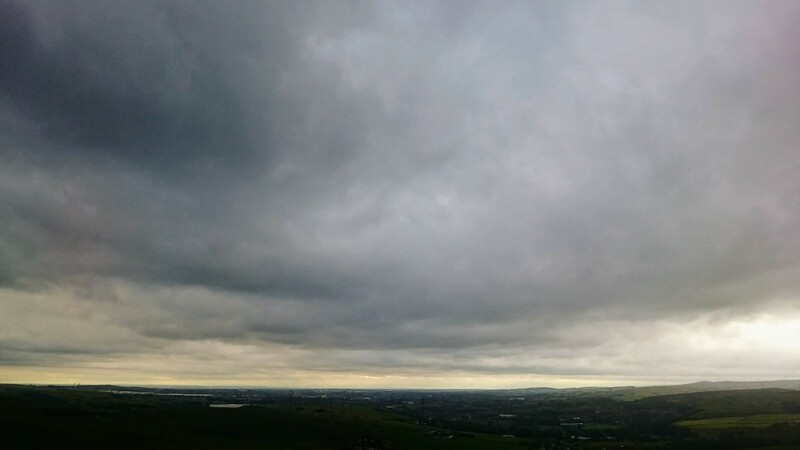 Given that the summer holidays have had their usual deleterious effect on my riding mileage, getting a decent sized loop in was definitely a good idea, and having paid money to secure my place ensured that I showed up in spite of the dreadful forecast. The wind and rain were sufficiently bracing for the organisers to close off the longer 85km route option altogether, so we were all restricted to just 70km of slippy mud and limestone, and whilst I think I could have managed an extra hill or so I will admit that I was not altogether dismayed by having the decision made for me at the start. The first hill both warmed us up nicely and served as an introduction to the type of riding that makes up most of the course: wide bridleways with unmade surfaces rocky enough to be a challenge on a cross bike, but not so difficult as to really make you wish for anything with suspension, because as soon as you’d dispatched a few kilometres of rattly stuff you were on quiet lanes where skinnier tyres and drop bars really helped. We settled into a nice rhythm and ticked off the first third of the course to Long Preston in about an hour and a half. The feed station here was remarkably fancy, with a huge spread of cakes and biscuits, proper coffee, and even a mechanic. 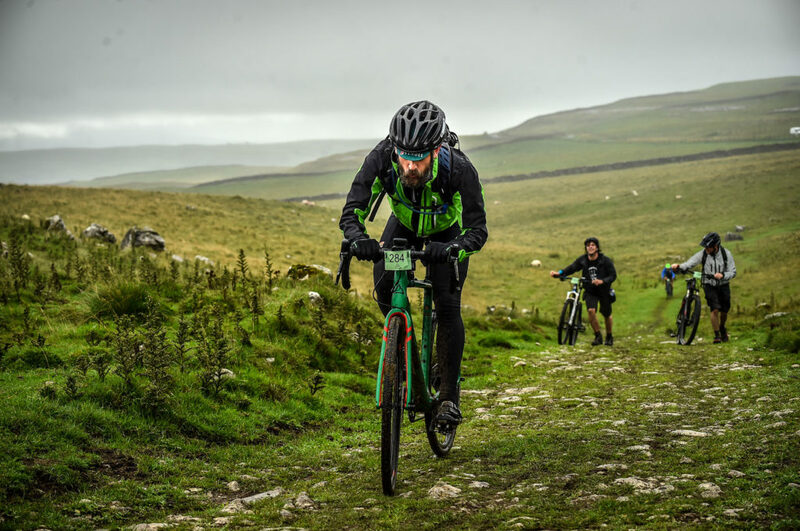 Rik took advantage of this last to have the horrible grating noise coming from his back brake dealt with, but we were able to get on the way before cooling off too much, and started out on the biggest climb of the day, creeping gradually up to over 500m on the way to Malham Tarn. The weather up here was towards the character-building end of the spectrum, but we kept moving and just touched the cloud ceiling a couple of times, before dropping down to the second feed station at about three and a half hours time elapsed. One last punchy climb after this chance to refuel, and we embarked on the long descent off the high hills. 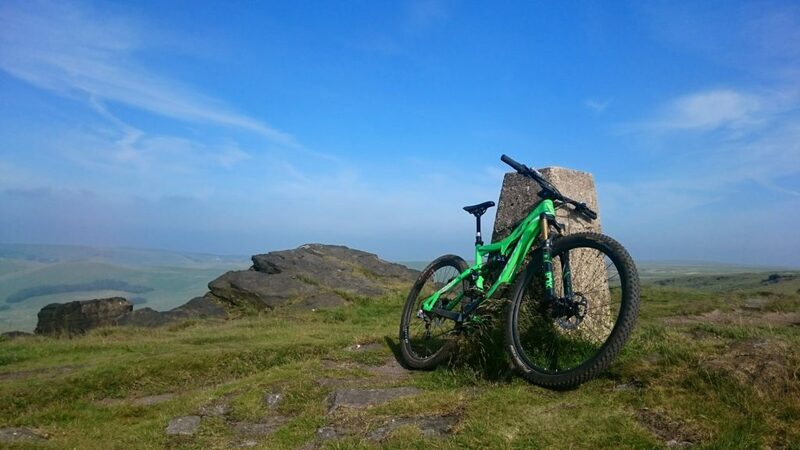 The singletrack down Calton Moor was remarkably good fun on a cross bike, a snaking ribbon of smooth trail, fast and entertaining, leading into a rocky farm track that took us back down to the lower levels of the Aire Gap. We traversed this over the course of the next hour or so, following quiet lanes, bridleways and towpaths, back to Barnoldswick to collect our finishers’ goody bags (with some pretty decent swag in them for once: a CNCed Hope bottle opener, some bike cleaner, stickers and whatnot, nice). We grabbed a sausage butty, chatted with a few mates, and then made a dash for the van in between rain showers, agreeing that the event had been well organised and executed, a smashing day out even with the fairly horrible weather. 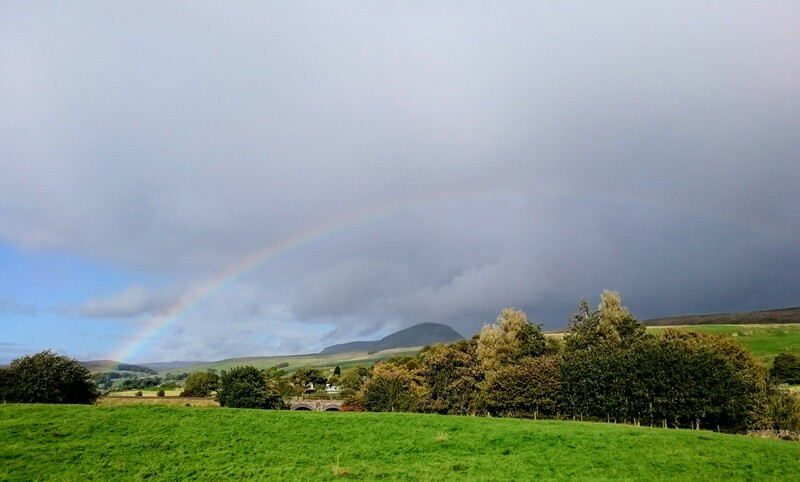 The Howgill Fells have been on my personal list of Rides I Want To Do for ages now, the rolling grassy hills abutting the M6 just before Tebay have always looked inviting to me as I drove past en route to some more northerly destination. I had however always held off visiting on the grounds that anything that verdantly green was likely to be waterlogged and unpleasant for much of the year. In light of the current spell of warm, dry weather, I thought now might finally be a good time to explore this corner of the north, and gathered a couple of friends to join me on a day off following the classic Howgills circuit from Sedbergh. The route follows bridleways up onto the main ridge right to the top of The Calf, then descends Bowderdale before looping back along the eastern edge of the fells via Ravenstonedale; plenty of .gpx traces of variations on this theme are available online, here’s the route we followed, wrong turns and all. As you can see from this and subsequent pictures, the ride was rather puncture-prone. We had four of the damn things. Our first happened before we even left the car park, and a good half-hour was spent trying to get a tubeless repair to hold, liberally coating the tarmac with sealant before we gave up and stuck a tube in there. Any reader thinking “Aaah, serves you right, you’d never have that problem with good old fashioned inner tubes” should note that the failed repair was of a very old tyre, and of the three subsequent punctures two were replacement tubes, the other an inch long slash that would have killed pretty much any setup. My tubeless kit held its air perfectly all day long despite clattering into numerous big pointy rocks with my usual inelegant hold-on-and-try-not-to-die riding style. I think my companions were just unlucky, as sometimes happens, no matter what you’re running. The sun was blazing down when we arrived in Sedbergh at 11AM, and as a result of our start-line mechanical we were already lightly toasted before even turning a pedal. 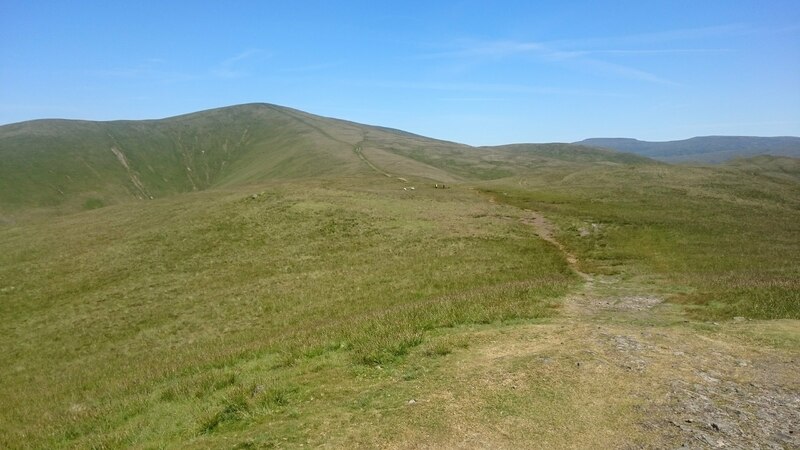 The first climb up to the top of Winder (…is it pronounced “winder” or “winder”? We may never know…) was a brute: steep, grassy, baking hot and sheltered from any breeze. I was developing a headache by the time we reached this first summit of the day, so I necked my emergency paracetamol and stopped to admire the view, which already stretched out beyond the Scafells away over the far side of the Lake District, and out to the Yorkshire Three Peaks in the other direction. After regrouping and rehydrating as well as we were able we continued our ascent up more moderate gradients, with the exception of the sharp kick up to Calders, and (via a brief pause courtesy of puncture number two) finally topped out on The Calf. 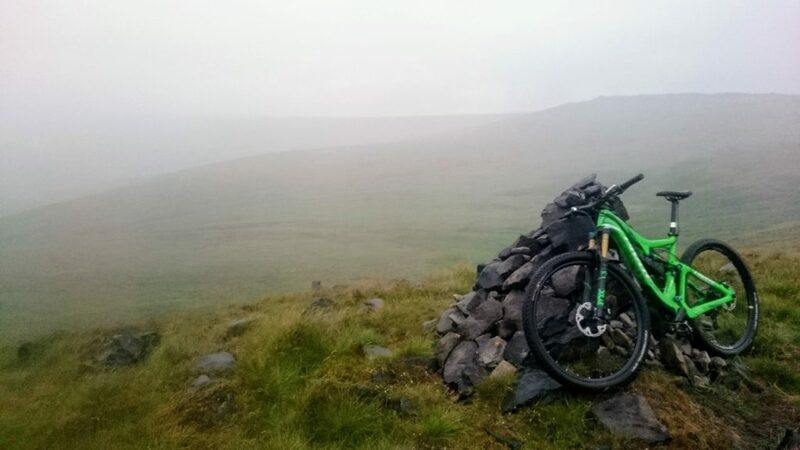 This was the high-point of the day, and the Howgills, at 676m. The small tarn marked on the map near the summit was completely dry, and in the distance we could just see the smoke plume from the massive fires raging far away on the moors in Saddleworth. Everything was bone dry and beginning to take on the warm tones normally associated with more arid climes. I could have stayed up here for hours, but we had many more miles to cover, and a pub stop scheduled, so after a quick point at the view and a bag of sweets we pressed on to the main event of the day, Bowderdale. 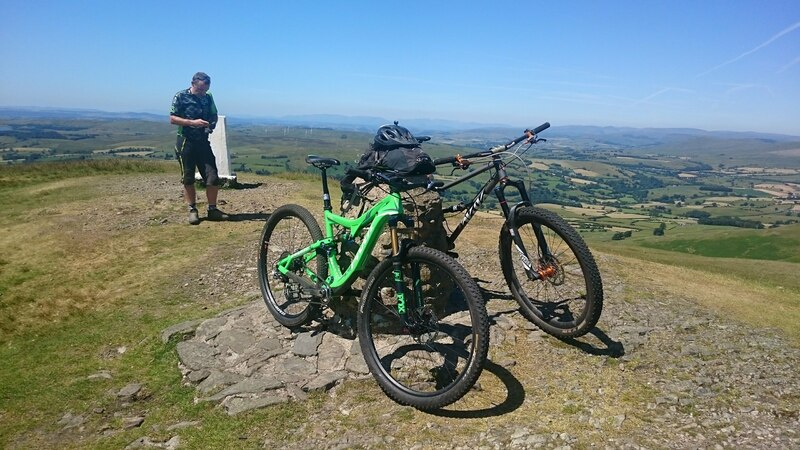 The Bowderdale descent is one of those routes that frequently pops up in the mountain bike media’s Top Ten UK Trails You Must Ride articles, so I was very interested to see what it was like and how it compares to my own personal favourites. 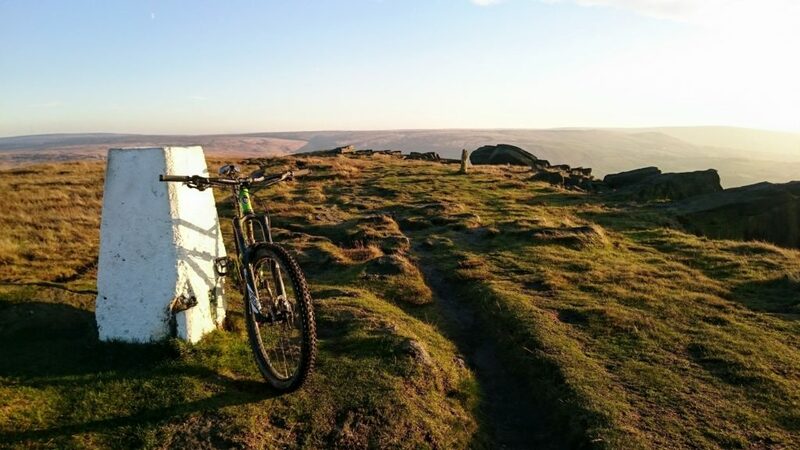 Nearly ten kilometers of unbroken singletrack, it starts off with a gentle roll from the trig point on The Calf, before turning into a frayed ribbon of rock-infested ruts curving around the shoulder of the fell, dropping into the top of the Bowderdale itself. You lose over 250m of height just in this one relatively technical kilometre down to Ram’s Gill, and I definitely needed a bit of a breather before carrying on into the longer, more sedate second movement. For the remaining seven or eight kilometres the path clings to the side of the valley, contouring round numerous streams and gullies, many of which have collapsed to provide an interesting off-camber exercise in traction management. 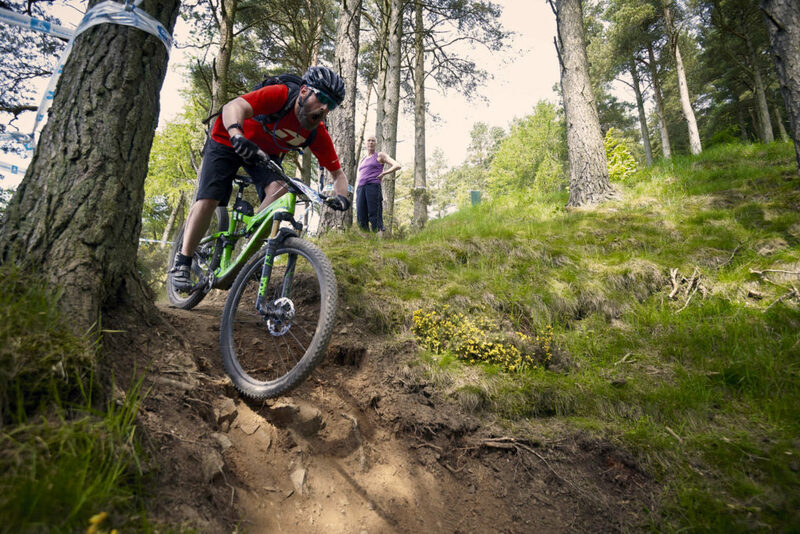 The path between these little challenges is mostly a narrow rut, just wide enough for pedalling; you need to watch your line carefully all the way down or risk being ejected down some fairly steep slopes. 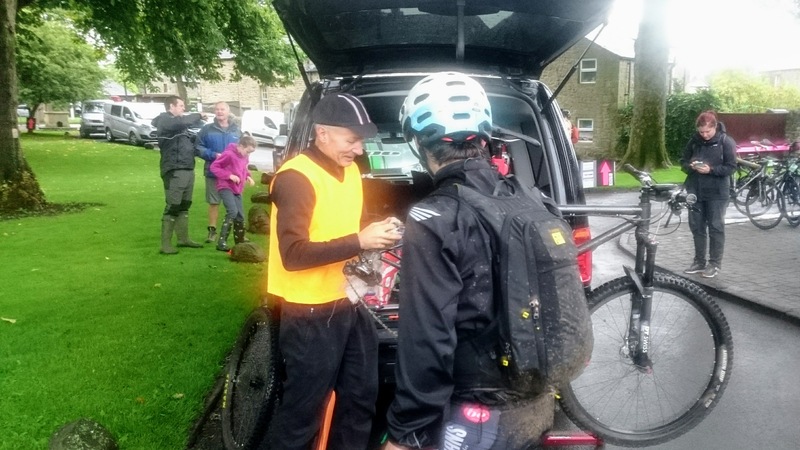 Even after two months of solid good weather, there was still a surprising amount of water about the place, and bikes and riders alike picked up a light coating of mud before we reached the road and rolled under the A685 at Wath. After a spin along some quiet back lanes to a leisurely refreshment stop at The Black Swan in Ravenstonedale we set about the tarmac climb to Adamthwaite, and what we thought would be a quick and straightforward ride back to the start. 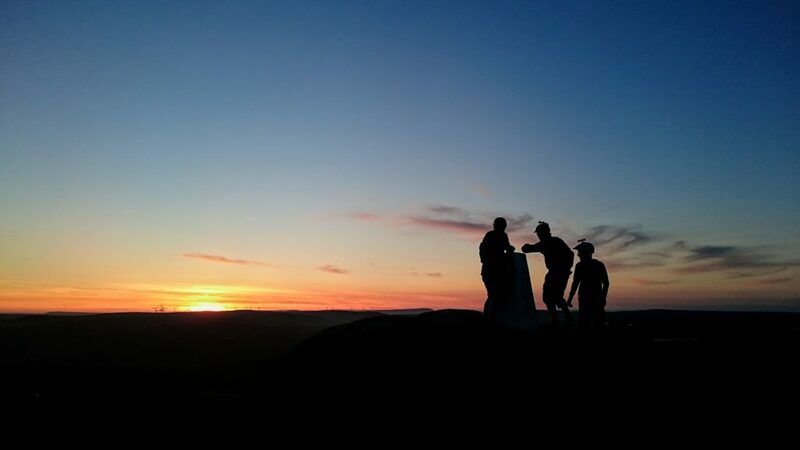 Two punctures, a wrong turn, several scuffles with uncooperative vegetation and farm-furniture, and varying levels of heat-related exhaustion put paid to that notion, so it was a very tired party who rolled into Sedbergh at well past 6PM. The first thing I did when I unlocked the van was hunt down more painkillers for the splitting headache that had manifested in the final hour, before hurling my kit in the back and leaving my companions in a cloud of dust as I set off for home, much later than intended. Even with this slightly trying ending, I had an excellent day out in splendid surroundings with great company. 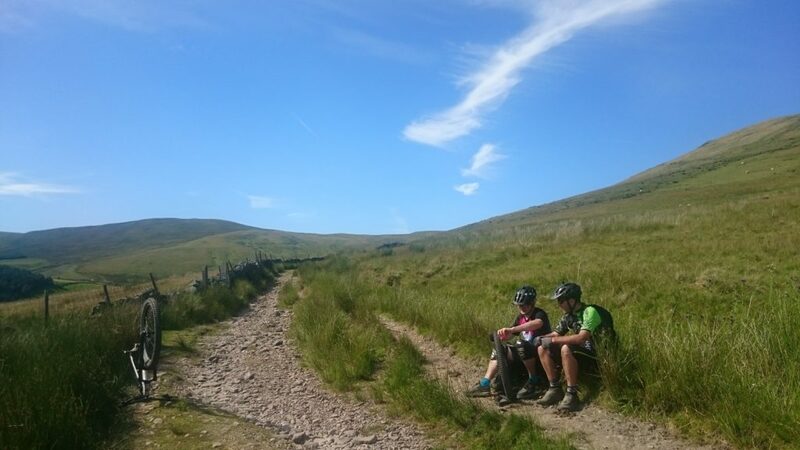 The loop round the Howgills is a proper Big Day Out, well worth saving up for a sunny opportunity just like this one. Even with copious mechanical problems and the odd route-finding mishap we had a marvellous time, and I’ll definitely be back in the future to revisit these lovely fells. The main set piece of the Bowderdale descent is very good, although its finest attractions are all blown through in the first third, from the top of The Calf to Ram’s Gill. The subsequent thread of riding down the last two thirds of the valley, whilst charming, is overlong, and by the look of it very wet and muddy for most of the year. In terms of absolutely ride quality it doesn’t quite compare to the various Torridon descents I have done, or even more accessible routes like Cut Gate or Nan Bield, but it is worth noting that we saw absolutely nobody else, even on a gloriously sunny day, and from the very top to almost the very bottom there are no gates, stiles, bridges, or ridiculous waterbars. You can ride this huge valley end to end without touching the ground (in theory; you’re doing very well if you do, it’s a good solid challenge even for a fit, technically competent rider). It is very definitely worth a visit, and the surroundings and approach are unique and beautiful. It had to end eventually. A month-and-a-bit-long run of dry, dusty riding broke in spectacular fashion last night when a skyful of lowering clouds burst above us and we got caught in the resulting torrential downpour on the tops. Watching the grey ceiling slowly dissolve into pillars of raindrops along the valley and out over the city until it finally caught up with us was quite a sight, although of course the view vanished completely once the weather hit. 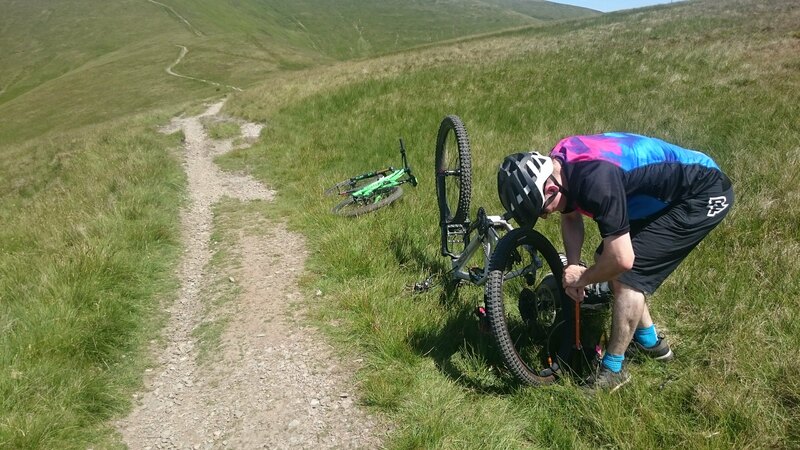 To add to the fun, just after things really got grim, one of our number suffered a show-stopping mechanical which required the removal of half a drivetrain before we could even start to roll and push him back down the hill to the pub. We stayed cheerful, but having set off in lightweight summer kit we were all so cold and wet once we got back we couldn’t face hanging around for a pint, and just set off home with heaters on full-blast. On the plus side, we did get a very pleasant ride in before our soaking in the last half-hour or so, the hills were deserted as everyone was watching the football, and the ground has been so dry for so long that we didn’t actually get particularly muddy, just very, very wet. 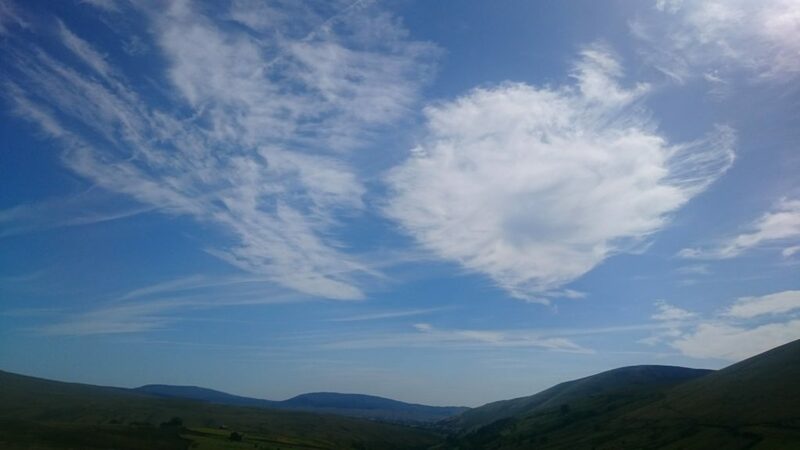 The weather forecasters are now all reassuring us that the lovely, sunny high-pressure systems are going to come back shortly, but even if they are wrong I feel like I’ve actually had a bit of a summer this year, for the first time in ages. It’s been absolutely lovely out there for weeks now. Blue skies and dusty trails everywhere. I must have ridden past this trig point hundreds of times over the past few decades, and the hill it tops is as dry as I’ve ever seen it. Marvellous. I spent the last Saturday in May with my wife and son in the beautiful Tweed valley, near Peebles. Sadly for my family, however, we weren’t there for a civilised weekend getaway with museums and tea-shops and gentle strolls by the river, but for me to muck about on bicycles yet again. 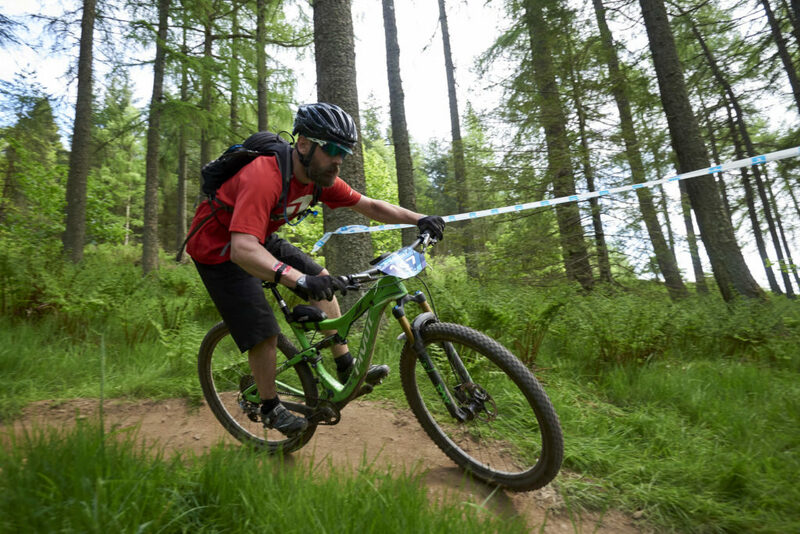 I had brought my family with me for the Glentress 7 MTB race, ostensibly to provide support whilst I avoided my paternal duties and rode round a forest like an overgrown child. In my defence I must stress that I was simply succumbing to my wife’s gentle hints that she would like to be involved somehow in this ridiculous pasttime of mine, and I certainly didn’t force them to join me. We rented one of the camping pods at the Glentress hub, which sit right next to the course, very handy for getting to and watching the race, and significantly less uncomfortable than a tent. The weather was pretty much perfect, dry and sunny but with a nice cooling breeze, and this helped make the experience bearable, I think. I’m not sure that wife or son particularly enjoyed playing at being an MTB pit crew, but then hanging about aimlessly for most of a day during which time your only communication with your partner or dad comprises a few grumpy monosyllables once an hour isn’t exactly a receipe for fun times. I did warn them how things were likely to be beforehand, but by the end of the afternoon they’d had enough and retreated into the pod to snooze and play games, so my vision of being greeted on the finish line by adoring wife plus child was not to be realised. The race itself was great fun, if very tough. Unsurprisingly in light of the lovely weather we’ve been having, the course was very dry and very fast, which is exactly to my tastes. The descents were all excellent: twisty, rooty singletrack with tricky little drops and steep chutes, flat-out blasts, off-camber corners and swoopy, flowy curves everywhere. Everything was just the right side of challenging to be fun and keep you on your toes, and I was pleased to make it down every time without hitting any trees and without holding up too many people. I even managed to pass quite a few riders on my earlier laps before fatiuge set in, not a normal occurrence for me. 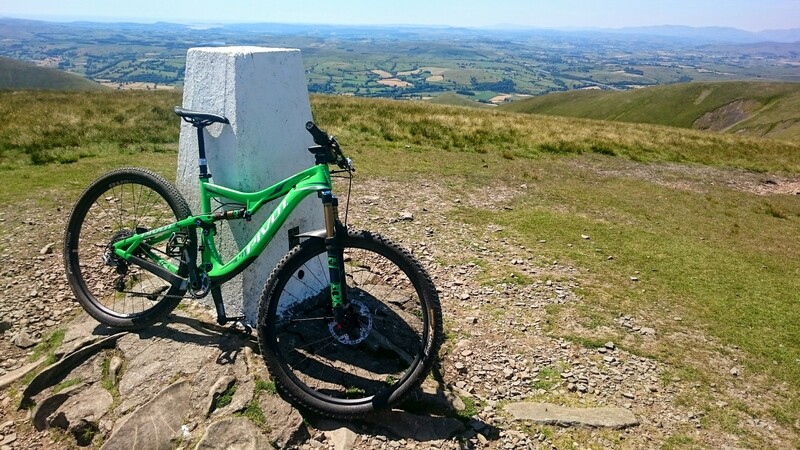 The out-and-out fun of the downhills almost made up for the brutal slog of getting up to the top each time. The climbs were tough but all completely rideable, even at my lowest ebb on laps four and five. Although the grind up the hilariously nicknamed Rue De Souffrance, a long straight slowly-increasing incline, got harder and harder every time, I still ground my way up there on every lap, pedals turning at a cadence of maybe 15rpm, but still turning all the same, damn it. During these climbs and descents I encountered several new and interesting places for pain to take hold: I don’t think I’ve ever had my triceps spasm before, for example, an indication of how much the course beats your entire body up. My back was making its usual protests by the end of lap one, but gave up whinging in due course and my legs took over the task of telling me I was an unconsionable idiot for the remainder of the race. I refused to listen and occasionally thumped my left quadriceps to remind it who was in charge. 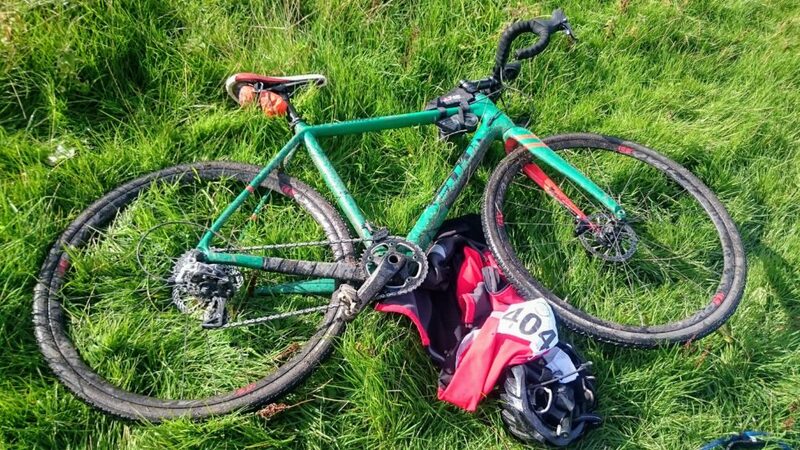 It exacted revenge by cramping fiercely in concert with its counterpart hamstring after I was sideswiped into a patch of nettles by an overenthusiastic team rider, thus compelling me to roll around in the venomous foliage for a while, yelling amusingly. On the positive side the resulting stinging, itching rash on my left arm distracted me from my weirdly aching eyelids for a good half-lap or so. By the end of the race very little of my anatomy wasn’t in some sort of pain, but nothing was so badly beaten up that I had to stop at any point, which I think is about as much as I could have hoped for, given my daring training strategy of doing one long ride two weeks ago and pretty much nothing else for the rest of the year. When the final lap came to an end I was very glad to see the finish line, and I felt like I had emptied the tanks fully in getting there, but at no point prior to that did I really feel like I wanted to stop. I did definitely go out too fast at the start, and I wasn’t fuelled properly for various reasons; I definitely made mistakes which slowed me down, besides just not having enough miles in my legs. Having said that, this was the longest solo race I’ve ever done by some distance, so I wasn’t expecting anything much from it, even by my own very low standards. Whatever the discipline I am usually glad just to finish without any disasters, and not coming last is a bonus. 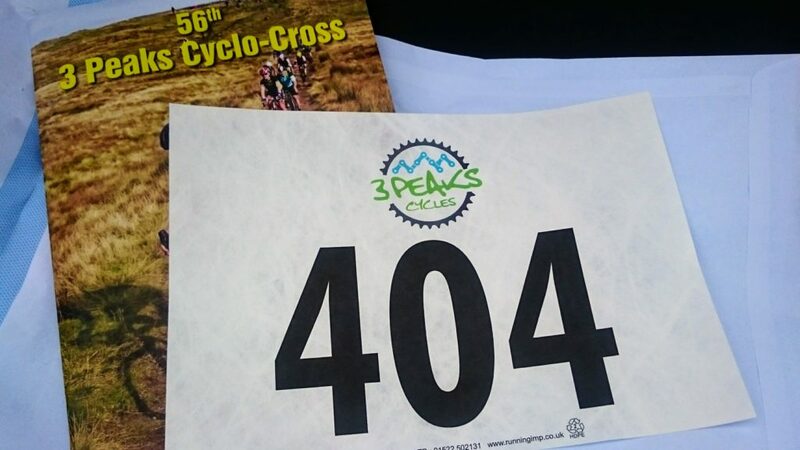 Apparently I placed 42nd out of 60-odd V40 riders, riding seven laps in a smidge under seven hours all told, which is respectable for a first go. I had a really good time doing it, and I have to admit it was rather lovely to have my family with me after I’d finished. I did spend plenty of time with them afterwards and I don’t think the experience was too awful for them, although I’m not sure they’re likely to want to come back again with me next year.